Automakers often take this opportunity to unveil some special products - and Ford's taken the lead this year with the debut of the 2018 Mustang Cobra Jet factory-built dragster. Further safety equipment includes standard NHRA-certified safety roll cage and two Racetech FIA-certified safety seats embroidered with the Cobra Jet 50th anniversary badge. It's the - deep breath - Ford Performance 50th Anniversary Mustang Cobra Jet turnkey race auto, and while the name may seem excessive, it's got nothing on the excessiveness of what lies beneath the badges. You may well question the relevance of such an offering but Ford certainly doesn't, seeing it as the continuation of a lineage which inspires customers to purchase and modify some Mustang muscle of their own. The Ford Performance Parts team developed the 50th Anniversary auto to be the most powerful and quickest Mustang Cobra Jet from the factory ever - capable of topping 150 miles per hour while turning in a mid-8-second quarter-mile run. These three cars compete in the NHRA Factory Super Stock class and in most cases, the field is running in the mid-to-low 8-second range while the class record is held by a Dodge Challenger Drag Pak driven by Geoff Turk, which ran a 7.996 at 170.1 miles per hour earlier this year. Colors come in Race Red or Oxford White just like the original. The brutal straight-line pace is made possible by a 5.2-litre V8 with a massive 3.0-litre Whipple supercharger added for good measure. Ford teased a revival of the Cobra Jet in April. It should deliver a quarter-mile ET in the 8.0-second bracket while topping 150 miles per hour in the Cobra Jet. 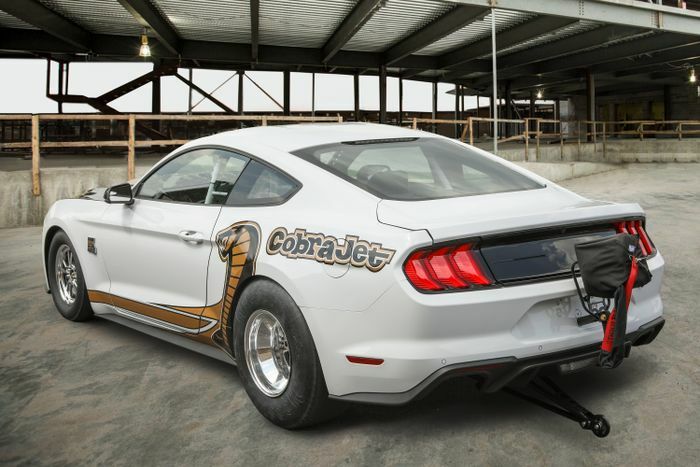 The 2018 Mustang Cobra Jet is a limited-edition turnkey race auto that honors the 50th anniversary of the original. Supporting this classic drag vehicle setup are a variety of components that should make it a serious racer. After its unveiling it will go to the 50th Anniversary Ford Performance Cobra Jet Reunion at Summit Motorsports Park, Norwalk, Ohio with an expected 150 other vehicles on show.